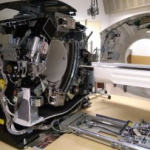 PET Instrumentation includes all development work done with our PET, PET/CT and MRI scanners, oxygen-15 production systems, and PET blood and metabolite laboratory methods. As most of our PET studies are quantitative, validation of used methods and correction algorithms for scatter correction, attenuation correction, partial volume effect correction, time of flight etc need phantom measurements as well as comparison measurements with human data. The aim of the PET dosimetry is to develop a method for radiation dose estimate. There are equivalent dose and effective dose estimates in literature for well-known PET tracers. The aim of the PET modeling is to support the medical PET research projects with best possible analysis tools to evaluate the physiological and kinetic behaviour of various PET tracers in the body. Physiological parameters e.g. perfusion, oxygen and glucose consumption, enzyme activity or receptor density can be quantitated by using specific mathematical models.